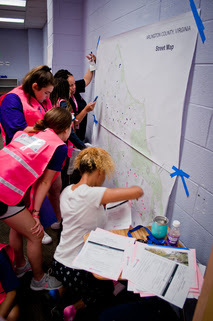 "HERricane” is a cutting-edge summer camp program designed to give high school-aged girls the knowledge, skills, and abilities to survive disasters and consider careers in emergency management and allied fields. The program focuses on experiential, hands-on learning related to personal preparedness, natural hazards, crisis communications, and public health. The camp offers a series of games and activities, from more traditional skills like cardiopulmonary resuscitation (CPR) and fire extinguisher utilization, to more creative experiences, including a cooking competition (where teams make an appetizer, entrée, and dessert out of emergency supplies) and a damage assessment scavenger hunt. The participants also develop leadership skills such as professional conduct, teamwork, stress management, and networking to prepare them for careers as emergency managers, public health nurses, first responders, and disaster journalists. Two HERricane programs took place this year- one in Arlington County, Virginia and one in Leon County, Florida. Arlington TV’s YouTube channel featured HERricane Arlington in the following video: https://www.youtube.com/watch?v=4eikVSChjXU. Both programs graduated over 20 participants. In Arlington, Northern Virginia Magazine recognized the program as one of 2018’s “Best Summer Camps.” It also received the Public-Private Partnership Award from the Virginia Emergency Management Agency for its utilization of non-governmental and sector support, including major in kind and financial support from Team Rubicon, the American Red Cross, and CNA. The founder of the HERricane program, Lauren Stienstra, is also promoting the program’s expansion. Agencies or organizations interested in offering the program can reach out to her at LStienstra@arlingtonva.us for a train-the-trainer guidebook. Earlier this summer, the PrepTalk partners hosted a symposium on School Safety and Youth Preparedness. It produced four new Federal Emergency Management Agency PrepTalks. Learn about Dr. Lori Peek’s work with a young survivor of Hurricane Katrina during her PrepTalk. She gives five ideas to help children cope with disasters. Peek serves as director of the Natural Hazards Center. She is also a professor of Sociology at the University of Colorado Boulder. You can find ways to engage children in emergency preparedness with Sarah Thompson’s PrepTalk. Thompson serves as director of U.S. Emergencies for Save the Children. She authored the Save the Children Prep Rally course. This program taught more than 100,000 children preparedness skills through play. Michele Gay, a founder of Safe and Sound Schools, provides a PrepTalk on school safety. Kristina Anderson offers her lessons learned as a survivor of the Virginia Tech Tragedy. Visit https://www.fema.gov/preptalks for the videos of all four PrepTalks. You can also find the question-and-answer sessions, discussion guides on youth preparedness and school safety, and more resources. Ready Girl brings emergency preparedness to comic books. A few weeks ago, the superhero went to Washington, D.C. There, she attended the UnidosUs Conference with the Federal Emergency Management Agency (FEMA). The annual conference draws more than 3,000 people. It focuses on the most pressing issues affecting Latinos. Ready Girl teaches kids in New York City about preparedness and creating an emergency plan. 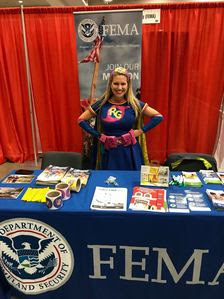 During the event, she and FEMA shared ways to be safe during emergencies. They talked about how to make a plan, get supplies, and stay informed. To learn more about Ready Girl, visit www.nyc.gov/readygirl. You can also access her comic book in English and Spanish. This year, the Americans with Disabilities Act (ADA) is 28 years old. The Federal Emergency Management Agency (FEMA) remains committed to ensuring that all Americans have access to its programs. This week the FEMA Podcast discusses the ADA with Linda Mastandrea, FEMA’s Director of the Office of Disability Integration and Coordination. The FEMA Podcast is a new audio program series available to anyone interested in learning more about the Agency, hearing about innovation in the field of emergency management, and listening to stories about communities and individuals recovering after disasters. 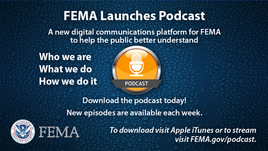 The FEMA Podcast is available on Apple iTunes to stream or download. 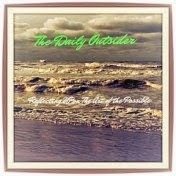 Approximately 20 to 30 minutes in length, the podcast will be updated with a new episode on a weekly basis. By subscribing, new episodes will automatically update on a listener's device. For more information, visit www.fema.gov/podcast.